Wheww. It’s been an interesting past 3 months to say the least. I’m going to try to share a lot with you that’s gone on in the hopes that something may help one of you out there struggling with anything similar and also help you get a perspective on just what a difference pursuing a level of fitness can make as well. I support the use of the hCG diet whole heartedly, but as I also support the pursuit of fitness following this – the photos you’ll see soon will show you why. Since the story of the last few months doesn’t end badly, I want to start with some of the positive. I took this photo on July 15, 2014, so this is what I look like 1 year and 9 months post my final hCG round back in November 2012. Those are the same shorts that I wore when I finished my last round of hCG btw – they’re a size 2 – honestly I wouldn’t probably actually WEAR these but they do fit. I finished R5 of hCG with about 21 lbs of fat on my body, and the above photo I think I have about 23 lbs of fat, plus 5 lbs more muscle in the above photo than in the below one. Which you’ll notice the legs of the shorts are much snugger on me now than below. I never thought I would be proud of having bigger legs! That’s what crossfit and weight lifting has done to my mentality. 🙂 I know it’s not for everyone, but it’s come to be what I truly enjoy and feel proud of. So again, just to clarify, my legs are bigger than the end of hCG – but this is due to muscle – something I realize not all ladies would be happy with, but easily avoided if you don’t workout. 🙂 I am proud of my more muscular legs now and what they can do. My goal is simply to be strong and healthy, not just super skinny at all costs. I hope that makes sense. when I started crossfit two and a half years ago I could do NOTHING. Nothing. Squats were done with a bar only, no weight, and even that was quite heavy for me and made me sore for days. In fact, when I did the initial training class for crossfit, I did only air squats (just your basic squat, no bar, no nothing) and I was so sore I had to delay the subsequent training for a few days because I could barely walk. Not only were pushups done on my knees, but even at that I still couldn’t lower my chest to the floor and get back up – I was only able to move my chest down a few inches. I have a funny memory…. of my husband trying to help me by stacking some books in a doorway where our pull up bar was thinking that being closer to the bar would somehow help me get myself up there – he’s like “okay, so now, just pull yourself up from there.” Yeah, that was a no go. I tried and my body budged about 1 inch. So even I didn’t completely realize just how much crossfit has changed my body until I looked at some bathing suit pics I took after my 2nd successful round of hCG just the other day. A lot of where my fat and low muscle tone was located was in my upper thighs and hips. I am actually about the same weight, 127 lbs but my body actually looks totally different now (July 22, 2014) over then. But pretty much my legs and hips look like two different people- even though my weight is the same. The reason for this is because so much more of my 127 lbs now is muscle, and so much less of the 127 lbs is fat. That’s why the same weight can look so much different on the same body. This is what crossfit, weight lifting, etc. can do. I am often asked why I did 2 more rounds of hCG following this since I had already reached a “normal weight”. This is why. How you look at the same weight can look VERY different depending on how much of you is muscle and how much of you is fat. The difference in my pics that I took after my 2nd round in 2011, and me now after much crossfitting in 2014, I have about 12 lbs less fat and 12 lbs more muscle than in the first photo. By losing additional fat with my 2 final rounds of hCG and building muscle in between those rounds through crossfit, I was able to be at the same weight in the end, but look totally different (better). As far as how much work it’s take me to get from a flabby 127 lbs to a muscular 127 lbs, it took 2 more rounds of hCG and 2.5 years of crossfitting (but not during hCG rounds) on an average of 3x’s per week- so 3 hours of exercise a week, and I’m almost completely sedentary aside from that. To be honest I’ve probably been looking like the final picture for quite awhile, so it doesn’t really take two and a half years of crossfit to get toned like this – I think a year will get you there, then you can just stay there and enjoy it! Some of you may know that my family and I physically moved back in mid April. Moving a 3 bedroom home is never easy, but on top of that, also starting around that time my health has been on the decline again. I’ve discussed it on other posts, but aside from having Hashimoto’s thyroiditis, I believe ultimately what I have that is the root cause of all my symptoms is chronic Lyme disease. I say I believe because I don’t have a test proving it at this time. It doesn’t matter to me, I’ve done enough research and compared it with my life the past 10 years to feel 99% sure this is what it is. I shared with you a treatment for Lyme I had back in November 2013 and how much better I was doing for a period of months afterwards in my 1st Quarter update for maintaining hCG weight loss of 2014. But slowly starting in April, many of my original symptoms started creeping back, once again. This isn’t new to me really, I’ve had periods of feeling in good health for weeks or months at a time many times in the past 10 years. During these times I am ME – I am extremely productive, I get a lot done, I do all the things a normal person would do like drive wherever I feel like, do errands, be more of the mom I want to be, write hCG articles at normal speed vs. 1/16th speed, etc. But everytime my health takes a dive again it never feels any easier to deal with. As humans I think we were born with the innate need and desire to be productive, to accomplish things, and to be helpful and useful to others. It is extremely frustrating and discouraging when you find your body simply will not cooperate to accomplish these things. This is further compounded by the fact that dealing with an illness that not many are familiar with and whose symptoms are rather odd, while appearing quite healthy on the outside, many people find my limitations difficult to understand and take it personally. This is hard for me because I want others to see me for what I really am, not what they see as lacking in. I sometimes think to myself that slowing down and being more limited is somehow easier to accept as you age because it’s what happens – but honestly I doubt this is the case. It probably doesn’t matter if you’re 80 or you’re 30 – adjusting to a lesser level of living is just not what we want. Being 33 though and feeling like I am not able to do and live in the way a normal thirty-something year old who has the responsibilities of a 30-something year old ie. not retired, have small child (who by the way EVERYONE who has the privilege to meet him says to, “wow you’re son has so much energy doesn’t he?”) is something I have a hard time accepting, not to mention to some extent I can’t accept the limitations completely since I do have these certain responsibilities in my life. So I keep trying to find a way to get better more long term. So far, the cold laser treatment I had back in November was by far one of the most effective things I’ve done in how much better I got and how long it lasted. So I am trying to access it again locally in my new area because I can’t really afford to move away for a month at a time every few months to stay well. But this is easier said than done and I have not been able to get the treatment I want yet, meanwhile, symptoms continue to gradually worsen. Frustrating to say the least, when I am aware of what really did help me just a few months ago but can’t get my hands on it to see if it will help just as much again. So all this is going on and we move a 3 bedroom house, while not having a ton of energy. As soon as we moved in the after effects of the great amount of energy and adrenal power it took to move ourselves really hit me. It was almost like overnight I could feel the change worsen quite a bit. I gained about 5 lbs in the span of like two weeks! I had been holding steady at about 124.5 lbs and even dropping into 123 lb territory at times right before we moved (I always go up and down 1-2 lbs here and there, but then settle back to 124ish on most days) for several months. It was quite SET there. In just a couple weeks I found myself at 129 lbs all of a sudden. Now, it’s not really a problem for me to weigh 129 lbs – I actually was stable around 127-129 lbs for many months following my final round of hCG and that was kind of the weight I was maintaining post hCG at for awhile – but later on down the road I managed to drop some additional weight and fat on my own. Both weights are perfectly fine for my body. The problem is that it was unexplained weight gain, and I wasn’t sure if the problem was going to continue and lead to further weight gain. What’s so odd about it is that outside of my health and the stress of moving, nothing about my actual dietary and exercise habits seemingly had changed- nothing! I was still crossfitting 4 days week, in fact I never even missed one session- we moved on a wednesday and I was at my new crossfit gym the very next morning. I continued to eat healthy like I always do – a head of kale salad a day, my home cooked meats, p3 smoothies. Additionally, my occasional intermittent fasting wasn’t helping all of a sudden – another strange thing. Perhaps a little more eating out of burgers and fries during the move, but not five pounds worth certainly, and I’ve been able to get away with eating out at Thai restaurants now and then for quite some time without gaining weight. As I discussed in my month away from home during my Lyme treatment, I ate out quite that month, but still returned home the same weight, and actually weighing a little less, than when I left. So there I was, a very fast gain of close to 5 lbs. On my 5’1″ frame it’s enough to have my favorite jeans be too snug all of a sudden to actual feel comfortable wearing. But hey maybe it’s just all muscle right? After all in the past that’s actually been the case! That might seem a little nieve to think, but I actually was feeling much stronger and more capable at crossfit around this time, so that fact really did kind of lead me to believe things were going in the right direction. The problem is I think I’m kind of at my “peak” of possible muscle mass for my height. I’m 5’1″ and I have about 102 lbs of lean mass. That’s fairly high. I mean, I know I could build more over time, but I’m at the point where it will be in ounces, slowly over time I think, rather than several lbs in so many months like I experienced before when I initially started working out after losing weight with hCG. Which is really fine. I have the same amount of lean mass right now as I weighed IN TOTAL when I was in high school. 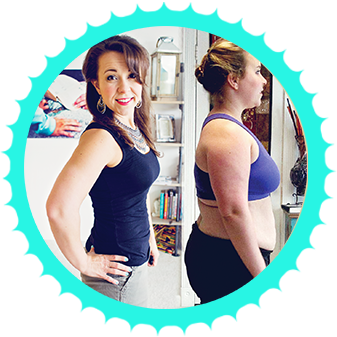 I went for a body fat test to find out- the gain was so fast and really no logical reason for it I needed to see what was what. The jeans totally not fitting was a pretty good indicator but still I held on to some shreds of hope thinking about how strong I’d felt at crossfit lately and how my deadlift weight had increased meaning my strength and therefore muscle ability definitely had increased since my move. The results weren’t too great- definitely had gained some fat. I kind of felt like I was in denial still since it was so out of the blue. So I started researching whether or not underwater body fat testing is truly as accurate as I thought or if there are variables that play a role. When the scale initially went up I kind of thought to myself that it was muscle and water weight associated with the heat and I thought to myself after the test the water weight could be read as extra fat. From my reading though, pounds of water is read as lean body mass, not fat, in hydrostatic BF testing, so bummer for me, it appears the fat I have is indeed the fat I have. So the question was, WHY? and HOW TO FIX IT? Intensity at my new crossfit is higher = possible excess raised cortisol = compromised Adrenals in me. Something in my diet that no longer agrees with me – one hunch I had was regarding certain fats. Lyme symptoms being worse = hormones affected by possibly = weight gain. I’ll talk about each of these. Okay, so I don’t really believe that foods with goitrogens (read: anti thyroid properties) like the Brassica family (which includes kale) can actually impair your thyroid function in general – unless perhaps you go to extremes with it……which, er…..I tend to do. I’ve been eating 1-2 entire heads of raw kale, every day, for several months. What! I liked it okay? I still don’t know that I believe this was causing issues with my thyroid function or not – I didn’t have time to only change one thing at a time, so my results I’ll talk about in a minute are not isolated to one cause. However, I figured it probably wouldn’t hurt to reduce my kale intake for the time being for comparison – I could probably use a little more variety in my diet anyway right? So I haven’t banned myself from my lovely kale salads, but I’m eating them more like once a week for the moment instead of 1-2 times a day. Just for any of you who might get freaked out over this, the goitrogens are inactivated by cooking, so they are only a *possible* problem when eaten raw. And again, I stand by my feeling that eaten in moderation like most people would, I think it’s highly doubtful they truly present a problem. As proof of this, I can say is I ate a whole head of kale almost daily from November – April without any problem with weight gain whatsoever and even had weight loss during that time. That’s why I’m leery this is really the cause. But I can’t ignore the possibility that an imbalance built up over time from that that finally reared it’s ugly head now. One thing that has definitely been different since I’ve moved is my crossfitting. The new “box” I attend is more intense. The prescribed workouts take me longer on average to complete than my previous crossfit gym. The WODS (workout of the day) were taking me 30-40 minutes to complete, on a regular basis, whereas my old gym the prescribed WODS took more like 10-20 minutes. Now don’t make any judgments here – a 15 minute WOD is nothing like jogging on a treadmill for 15 minutes. And that’s not all we do – there’s always the “warm up” which I have no idea why they call it that because it’s its own workout, and often a heavy weight lifting portion like deadlift or backsquat. But the WODS are the truly intense portion where when you finish you literally throw yourself on the ground to recover and resemble a tomato. I was managing 10-20 minutes of high intensity quite well on a regular basis, 4 days week, with the occasional longer wod of 40 minutes or so. I was still almost always the last one done, but that’s okay with me because I focus on form and weight, so I am able to do things heavier and without assistance (pull ups without bands to help etc, push ups always always real, no knees even if there’s 150 of them), just takes me a bit longer, and the Lyme had definitely affected my stamina so despite being in very good shape I just still can’t seem to beat the time of even newbies at crossfit. But when I started at my new box, I realized pretty quickly that the workouts chosen pretty much were always taking me 30-40 to complete. They are a little more cardio focused WODS. Which with my lyme is not my strong suit, thus they take me a long time to complete, which means I am operating at my absolute peak level of effort for a long time in order to complete the workout. I figured I would adjust to it soon enough and of course get stronger in the process. And in some ways I have. There is a stronger focus here on lower body weight lifting as well, which is something I’ve needed so I love that. My lower body strength is really improving here because I’m doing heavy deadlift, heavy back squat, etc. much more frequently. But I just felt like my newly increased efforts at crossfit were not matching up with my results in my body fat test. The conundrum was this: I was working out harder/better/more often than I ever have, it always feels good during/after so there is no indication the workouts were too much for me that I could tell, but I gained 7 lbs of fat in the past 5 weeks and lost 1 lb of muscle. I decided to do some research to see if other crossfitters are having trouble with fat gain – the consensus was that crossfit is good as long as you don’t do it TOO much. My research left me feeling that perhaps the workouts were too frequent and too intense for my current state of health leading to cortisol levels that are too raised, too long, too frequently. This can easily lead to fat gain. I will admit it was a bit of a bummer for me to be reading this info and thinking that I might need to start modifying and cutting back a bit to keep my body balanced. The problem for me comes in being that I LOVE crossfit. It’s not simply what I try to get out of it. It’s how I feel when I go, how I feel after I go. I’ll get to what modifications I made with crossfit this past month shortly. I have had a sense that my body doesn’t care too much for coconut milk for awhile actually. But I’ve been able to get away with having it without gaining weight for several months, so I chose to ignore it. I actually noticed that in general I felt like I wasn’t digesting fats too well the past few months and that I feel better when I eat less fat and more fruit carbs. It’s not too hard to make a connection between chronic illness and weight – whether it’s unexplained weight loss or unexplained weight gain. Chronic illness affects the various systems in our body and how they operate so it only stands to reason that if the system that regulate our body’s metabolism and how it utilizes fuel is effected negatively, our weight will be affected negatively as well. It’s been a long time since I ate low carb. I haven’t needed too. The majority of my carb intake is in the form of whole fruits, and occasional non-gluten grain like organic corn or rice. Although it’s being said now that technically all grains have gluten-ish type characteristics. I don’t know if that’s true or not and I’m not of the extreme opinion that all grains are always bad. With my bodyfat test results, I wanted to come up with a plan of action to try out. I decided I might try a short period of time on low carb again and see how that did. It would be different from previous low carb eating because I’m mostly dairy free and nut free these days, so the majority of my food is coming from simply meat, veggies, some seeds, and stuff like coconut milk, olives, etc. Since it’s been so long I was a little concerned about how I’d feel working out at crossfit without carbs in my system. The first few days were okay, since I still had enough glycogen stores to fuel my workouts. Day 4 of low carb, on June 6th I felt like SEE AYE ARE PEE at crossfit. If you didn’t catch that I said CRAP. Uggh. I didn’t even finish the workout. Do you know how long it’s been since I couldn’t get through the entire WOD? A long time. I was about ready to down half a watermelon after that. Crossfit is something that makes me feel very good so to feel so crappy there wasn’t cool. I do recall that there is usually an transition period for eating very low carb. It was time to check up on those details again. Let me first say that this applies to people doing certain kinds of working out. But it appears low carb just doesn’t mesh well with crossfit in particular because it’s highly anaerobic in nature. Bummer for me. That’s okay I found a solution that’s working for me. The 2nd link is actually more about a ketogenic diet, which is technically different from low carb because my protein/fat ratio I’ve started with is probably not accurate to be ketogenic. One main point though is there IS an adaptation period where you feel different (like crap) before you feel normal at your workout again. It appears I may need to change how I’m doing this if I want to give it a fair shot of success. He essentially feels (with good logic to back it up) that being keto-adapted and highly anaerobic workouts (aka crossfit) are not a good combination, and he recommends carb-cycling for such endeavors instead. So I went from my high of 129 lbs a little over a month ago or so, to currently between 125-126 now – almost back to my 124.5 comfy number, and it shows in how my clothes are fitting (much better again) and how my body looks (all photos taken above are at 126 ish lbs just a few days ago). The following 3 things are the major changes I’ve made during this time. Wait, did you hear that right? A low fat high carb diet? Isn’t that like so 80’s? I wonder how much heavy cream got wasted by the milk companies during all those years of gallons of nonfat milk-drinking we did with our mothers growing up. Remember how it was almost translucent in your cereal bowl of iced shredded wheat? Yuck. No no my friends. My kitchen is not full of nonfat milk and whole grain pasta, so no worries there, I haven’t gone mad. In my experimentation, I got the feeling that my body is rather sensitive to some fats right now, especially coconut milk possibly which I’d be having daily as well. Also logically I feel like my body is pretty adapted to burning carbs for fuel because that is what my body uses when I crossfit – with workouts that intense the body can ONLY use carbs and glycogen to fuel the workout from my research. So okay maybe my body is more carb adapted. That’s fine with me since that’s what my lifestyle involves. What would happen if I purposefully ate more fruit and less fat? I changed up my P3 smoothies – I had been eating my favorite Thai Coconut smoothie daily for a while, so I switched over to simply frozen fruit (in higher amounts than previously), ice, water, and stevia. No fat. Vs my previous smoothie which was fairly high in fat with the coconut milk content. I’ve been having 2-3 of these a day depending on when I’m hungry and if I had crossfit that day or not. I have purposefully been eating less fat (although I still never count calories or carbs or fat grams or anything that involves numbers and food), and eating leaner whole foods instead and a lot more fruit. My body is loving it right now. Keep in mind, I’m not simply removing more and more foods and food groups- that could quickly sound extremely restrictive and depressing, so I don’t want to confuse you guys. Rather what I have done is remove or reduce how much I eat of certain things and increase or add other foods that I wasn’t eating or wasn’t eating much of before. So I am actually enjoying my new found variety of foods I’m able to eat. I reduced my crossfit days from 4 to 3 days a week, some weeks even just 2 days, and I am currently modifying workouts by capping any WOD I do at 25 minutes, even if I’m not done. I’m also making more time to do the weight lifting over cardio type stuff. For instance, if the prescribed wod is a bunch of running and other cardio type stuff, I’ll just skip it entirely and do some back squats and pull ups or something. I had to process this for a little bit before making these changes though – it’s hard to modify for me- I always want to finish and do it “the real way”, no matter how long it takes me. Doing something hard and challenging like this leaves me feeling good and accomplished afterwards. Also I was worried about appearing lazy or lax amongst the other crossfitters. To be perfectly honest, the night that I was researching all this information about crossfit and gaining weight and adrenals and all that stuff, I felt pretty down – almost a little dizzy! It scared me to think that something I loved doing could possibly be hurting me and I was scared that changing it up might produce negative results, like further weight gain, or loss of some of the muscle I’d worked so hard for. It was unknown territory for to think of making a possible change in this way and I wasn’t truly sure of the outcome. I felt tired and it takes so much emotional strength to handle this type of experiment. But with this experience I realized that if I want good results for my personal body, with my own health issues that I battle, that I have to be able to stick up for myself now and then and do something different based on what I know, not on how things appear. Everyone at my crossfit gym has been totally respectful about it, but it still just felt weird for me at first. I’m slowly getting use to it – informing the trainers there of the health stuff I’m dealing with has really helped and they don’t try to be overly motivating with me like they usually are – you know, the whole “c’mon keep going! just 10 more! K 5 second break then back at it!” I really do have to pace myself because of my stamina issues and break longer between max efforts. I’m okay with it and they just let me work at my own pace, knowing I’m doing my best and that pushing my limits is not the proper thing for me to do at this time. Just throwing this in there in case it somehow is part of the puzzle. I haven’t removed it, I just eat it 1-2 times a week now vs. 1-2 times a day. I’m happy to say that not only is the scale no longer going up (wheww! That was scary), it’s coming back down. I’m consistently in the 125-126 lb territory now, so about 3-4 lbs are gone at this point, and less than 2 lbs from being back where I was a month and a half ago. It’s possible I’m even there now as far as actual fat on my body – the shift in my body going on inside might be gain of muscle and great loss of fat- I won’t know till I get another follow up body fat test. They are not as easy for me to get too frequently now because I no longer live close to a facility where I can get it done- the drive is fairly long. Additionally – intermittent fasting is working for me once again. I only do it occasionally, but when I do, the idea is that over the course of that week, I should see my weight come down a bit – it had stopped doing this in the past couple months and my body was acting like I had never fasted at all and I was gaining weight despite these fast days. Now I’m once again gradually tightening up and feeling my jeans get looser and the intermittent fasting is indeed helping, as it’s supposed to. What Do I Think is Helping the Most? I feel that my adjustments to crossfit and my diet changes are making the most impact personally. Oh! I need to eat less carbs, more kale, and workout MORE! But by analyzing what was going on and coming up with possible questions, researching those questions on google (ie. gaining fat at crossfit), and come to some likely conclusions based on that info, I was able to experiment with something that would likely work for me personally, which was actually different from the main stream popular thing that’s supposed to be effective right now. Eat more fruit, less fat, less kale, and work out LESS. I know! Still trips me out to be honest. In your case, perhaps the real answer IS to eat less carbs and workout more. If you’re a pasta-carb-aholic and don’t currently exercise, that may be your answer. I’m just showing you my thought process in case it helps you take apart your own scenario, piece by piece, so that you can find some possible solutions to whatever isn’t working for you at the moment. And I’m not griping over 2 or 3 measly pounds here. I don’t even really care if I get back to 124. I mostly wanted to make whatever changes I needed to create a better balance for my body to continue maintaining. Don’t give up. Please don’t give up and think you are not one of the ones who can do this, as if somehow you weren’t cut out to be able to make these changes. I had 1 round of hCG that was a total flop, in fact I regained 14 lbs in just 9 weeks following it. Since completing my final round of hCG I have gained and lost 4-6 lbs on 3 occasions now (thankfully without the use of hCG). Previously I was completely addicted to sugar and could eat an entire half gallon of ice-cream in one episode of the Biggest Loser. I’ve dealt with hypothyroidism and adrenal fatigue. I was a daily diet coke drinker. I’ve birthed a child. I weighed almost 200 lbs right before my son was born at 5’1″. So I’m not special. I’m a regular person like you. I really do feel that if I was able to make these long term changes that you can do so as well. 1. Acceptance – of your mistakes, of your struggles – they are normal. 2. You may need to try something extreme – I had to cut sugar out cold turkey completely from my diet in order to stop craving it. 3. Do experiments and trials. This helps me making changes – I view it simply as a short experiment to see what the results are and do not commit myself to anything long term until I see how I handle it and if it’s worth it. eaten to to figure out what I’m sensitive to and what I can eat without a problem. Your v logs and the huge amount of information on your website has been such a help to me. body wants to be treated. Very educational…. questions I have that she doesn’t. It works like a charm…. Well, I feel lucky to have found you this morning. I am on day 27 of my first HCG treatment. I chose the worst time I could possibly have started this diet. I am 79….have a fatty infiltrated liver (non alcahol) and had a stopped up duct. I decided to do this diet because of a daughter in law…who lost all her weight…and encouraged me to do it also. It took her 5 periods of the HCG. I just wanted to learn how to eat with out fat with the idea that would get rid of a lot of serious pain in my right side….I assume it was the liver and duct problem. My health had become a priority because of pain wrapped around entire rib cage and was affecting my kidneys with a bacterial infection. Cleared that up pronto when test proved that a problem. Decided to go for the HCG even tho I faced Thanksgiving dinners (3 of them), Surgery, and Christmas coming up. That idea has worked, after a serious surgery (while on the HCG shots.) only one area on right side is still painful when doing certain simple things around the house. ( x piano teacher, 5 minutes…and pain starts) I have lost about 17 lbs….but for the past 4-5 days have not lost. I am Ok tho…because not gaining. I saw the 6 apples day in one of the books I just bought, and started in…but decided I needed to know more about that. My book did not say to do the shot or not to do it. That is how I found your site….and took my morning shot and am not doing the apples today. Any input you might have for me….I am only interested in being “able” again. To walk, (painful feet) paint large paintings (artist) play piano some, (retired piano teacher) and paint with grand children again. Not to be a shapely 40 year old again. Thank you so much for all that you are doing to help people to help themselves. Do you know if 79 year olds have been successful for health reasons on this diet. As a Hypoglycemic ? was afraid of trying this diet….but has not been a problem…I am amazed. No headaches, not really sick at stomach…so encouraged to keep on. Staying quiet. Thank you @cykaenkabaaniuchuujin:disqus – I do feel happy and healthy in my body, which I feel is the best achievement because I didn’t feel that way when I was younger and even thinner than I am now. It’s definitely at least 50% mind, if not more. I really enjoyed listening to this podcast. Your candor is so endearing :). 1. Decreasing mental and physical stress. The mental part was actually by far the most important for me. It required me to make some lifestyle changes that caused me to feel really disappointed in myself but in the long run, it was the right thing to do. 2. Homeopathy. Seriously. Most effective medical intervention of the hundreds of things I’ve tried. I found a good MD(H) and have been working with him for just over a year and have had tremendous improvements. 3. Continuing to identify my food sensitivities. Check out the book “The Plan.” I thought I knew a lot about food sensitivity but gained several insights from that book. I just love this. Totally. YOU look Great. I am so PROUD of you and I do not even know you, way to go. I jut hope that some day I to can do it. Thank you so much @disqus_g5PttCmnYl:disqus! and yes you can do it- I am seriously the last person I would have thought to be able to make such drastic changes. Hi Chica, It is Bonnie here, I just got my order from Nu image for the first time. The Doctor told me to take 200I U I told her that I only have ever only taken 175I U She said to take 200. I need a few words from you to me on this. I know you are not a doctor, but this is a short round and I want to loose as much as I can, I here that 200I U will make you gain weight. I just do not know what way to go on this. Please any words on this will help me. I start on Sunday Aug. 17th. THanks Bonnie from Canada. Hey @disqus_g5PttCmnYl:disqus! It’s not that 200iu would make you gain weight, but it’s that it’s too high for the vast majority of people on the diet from what I’ve observed which causes excessive hunger – and I feel that the dose that you feel the least hungry on is the dose you will also lose the most weight on. Most clinics does high like that and I honestly don’t know why- dosing is very individual from what I’ve seen- some do well on 200iu but many need a much lower dose like 125iu so if it were me, I would take what I feel is best and adjust it as needed. I hope that helps. I don’t mean to go against what the doc says but if I took 200iu I’d be starving. Sorry I’m just seeing this girl!